Commuter trains are trains allowed to change their running direction situation-related. Generally these are trains which can drive in any direction without requiring locomotive shunting. Trains exclusively running between Terminal Stations, however, do not necessarily need to be defined as commuter trains provided option Stop Non-Commuter Trains in Terminal in the Rocrail properties is deactivated. Option Commuter Train has to be activated in the loco properties. Each block the train should be able to access must allow commuter trains. Each block the train should be allowed to change direction within must either allow direction changes or has to be defined as a Terminal Station. Trains shuttling between stopover blocks, i. e. blocks not representing end blocks of a line, are sometimes referred to as yo-yo trains. This type of train is achieved if one or more stopover blocks allow direction changes. In these cases routes leaving the block enter side - if any - are evaluated, too. 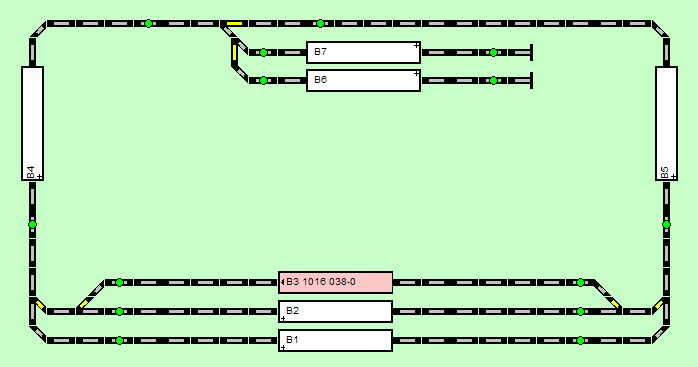 In case a route is found the placing of the loco and the block enter side will be swapped allowing the train to leave the block in opposite direction.